Sorry, unfortunately, Web Link Builder WTD (6 months plan) is no longer in our catalog because of its illegal activity. Scan the web for link partners. A must have for webmasters and seo experts. Find link partners, directories and search engines to submit your site in a snap. Drive traffic to your site from search engines. A tool writen by SEO professionals has been tested and proven to rise ranking in Google, Yahoo, msn etc. Features Version 1.0.0. - Unlimited uses for 6 months license. 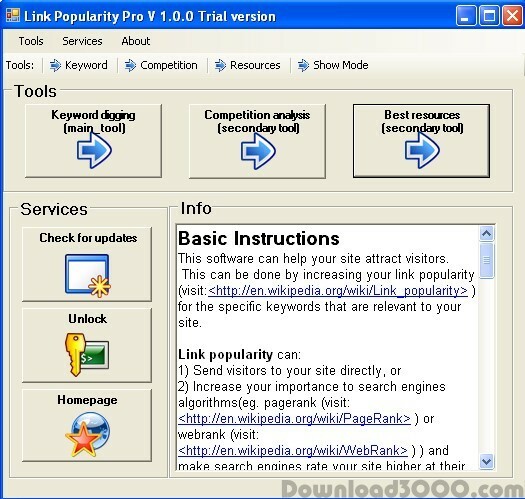 - Find relevant link pages. - Find link exchange forms. - Find directories-search engines. - Check where your competition links. - Export as text (.txt) format or Excel format (.xls). Benefits -Stand out from the competition,raise your search engine ranking and keyword relevancy, climb higher in results and drive precious free traffic from the search engines. -Find the perfect relevant link partners. -Locate partners that are willing to exhange links. -Save time and money from expensive SEO plans. Get info about Google PR datacentres.